On January 16, 2017, Rice Law Firm Attorney Beth King attended the Annual Ormond Beach Neighborhood Center Breakfast honoring Dr. Martin Luther King, Jr., at the invitation of Ms. Tina Carlyle, event coordinator. 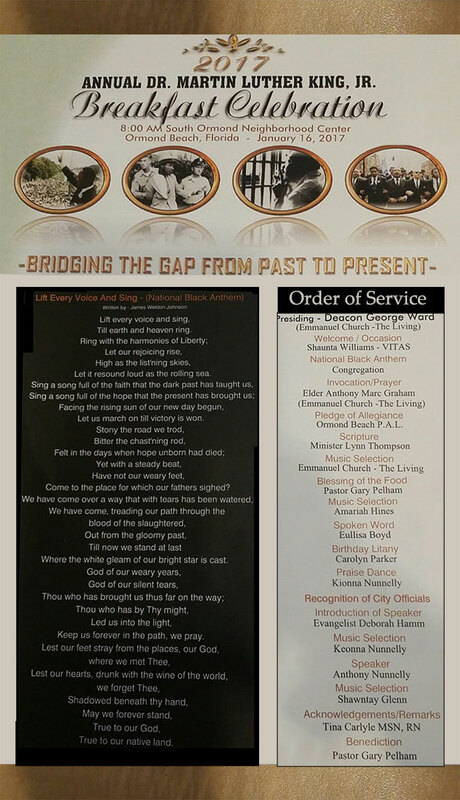 The program included speakers from across the community on the historic and religious legacy of Dr. King. Ms. King and her husband, Jeff, who attended with her, were once regulars at the Division Street facility during their son's PAL basketball days, and they enjoyed catching up with old friends. Rice Law Firm honors the Legacy of Dr. King on this the national holiday in his honor.